Hey, Raiven! Thank you for taking your time for our interview! 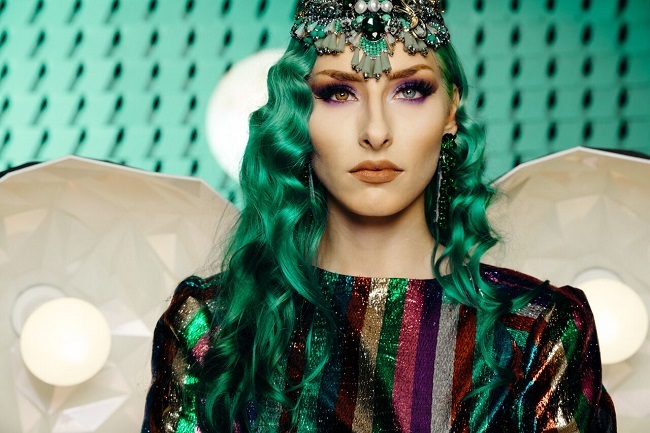 This is your third try to represent Slovenia at the 2019 Eurovision Song Contest – third time lucky? To be honest I just want to use the media attention it brings to promote my upcoming EP. If I end up winning and get to represent Slovenia at the Eurovision contest all the better. All of your attempts left a huge impact on the viewers and fans – last year you’ve also hosted the final evening of EMA – have you enjoyed the stage from the other point of view? Yes, I loved the experience. It was very challenging and I would love to do it again. Right after your performace at EMA 2017 (awesome dress by the way!) you’ve released your first ever album, which you named ‘Magenta’ – is there a special meaning behind the name? You’ve proved that you belong on the stage – even in the theatre. Can you tell the fans here at the ESCBubble.com, who didn’t manage to see you yet – what kind of experience was for you to perform in The Trojan Woman? I never thought that I would love it as much as I do. It has taught me a lot about stage presence. You can’t hide behind a microphone and behind the music. I love it. We’ve just been accepted to a theatre festival in Cyprus so I am really looking forward to performing there. If you win EMA this year you’ll travel to Tel Aviv – are you familiar with the Eurovision Song Contest itself and have you been following it? Do you have any all time favourites? Yes, I am familiar with the Eurovision Song Contest and I have been following it since I was little. I remember watching the show with my family. But I have to say my all time favorite is Latvia’s Aminata in 2015 with her song Love Injected. And of course Lea Sirk with Hvala, ne! Can you tell us more about your stage performance, are you already working on it? Thanks, Raiven. Do you have a message for your international fans here at ESCBubble.com? I am overwhelmed by all the support for KAOS I have been receiving since the snippet came out on YouTube. And I am forever grateful to every single one of you for your comments, messages and stories Thank you for your support. I'm a working Mother to a demanding teenager, but always find time for my beloved Eurovision! I've been watching and enjoying the contest since I was a child, so working with ESCBubble is a dream come true. My favorite Eurovision song is Joy Fleming's "Ein Lied kann eine Brücke sein", everyone needs a bit of Joy in their life! For favorite winner, Anne-Marie David's "Tu te reconnaîtras" will always be a benchmark for quality. Here’s how the winner of Montevizija is going to be selected! LIVE: Eurovision – You Decide 2019!